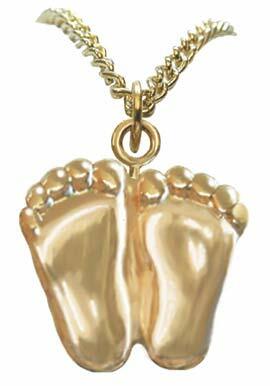 Description: Beautifully finished gold-electroplated necklace with the International Pro-Life Symbol "Precious Feet". The Precious Feet are the exact size and shape of an unborn baby's feet at 10 weeks after conception. Since the infamous Roe vs Wade decision of 1973, the Precious Feet have been quietly doing their work changing hearts and saving lives. when I wear the precious feet necklace and pin, they are noticed and talked about. what a wonderful witness for the sanctity of life! Whenever I wear this necklace, along with the earrings I bought, to church or the Catholic booth at the fair, I always get compliments and tell others where I bought them. I just love this necklace! I bought one in silver and gold for the whole staff and they were a big hit. I wear mine every day to work. Clients comment on it often. The gold has worn off a bit, but still looks amazing. 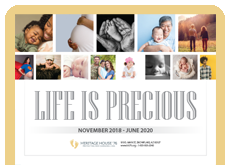 The "Precious Feet" symbol provides an excellent avenue to educate people of all genders and ages about the Miracle of Life, which begins at inception. These charm necklaces will make great Christmas gifts for my three nieces. I like to shop throughout the year for Christmas! These necklaces were given to teens who have worked hard to promote the values of God, Family and Country. They loved them! I had purchased both the silver and gold necklaces along with earrings and I can usually sell one of each of the silver and gold. I wear mine all the time.